Karen Huger is taking to her Bravo Blog to dish on last week's Season 3 premiere episode of The Real Housewives of Potomac. Karen Huger reveals she was very disappointed by her co-stars' reactions to the news about her husband Ray's tax issues. BravoTV.com: What was your reaction to the news about your husband’s tax issues? Tell us about finding out. Karen Huger: My reaction was that of any woman who loves her husband — disbelief. Bad things happen to good people all the time. After moving past the initial shock, I went into mommy/wife/soldier mode, ensuring that my family came through this intact. BravoTV.com: What do you think about all of the ladies’ reactions to your husband’s tax issues in the episode? For example, Gizelle saying that it must have been why you moved. What was it like watching everyone discuss it now? KH: Nothing surprises me with these ladies. I will say it stung, watching each of them attempting to capitalize on my challenges. Viewers have witnessed most of the women struggling for three seasons as part of their own stories. Gizelle's comment was the most hurtful because I've known her the longest. Her opinion was just that — an opinion. In the first place, it’s NONE of her business. In the real world, when people decide to move, they do it for many reasons like empty nesting, loved ones, etc. Gizelle's words are a past First Lady of the church’s testimony to the true wishes and hopes that she holds in her heart for me. Initially, it appears to be hate, which is possibly beyond forgivable. Gizelle’s treacherous ways are NEVER forgettable. I believe in surrounding yourself with positive people who support and love you. If this is her way of showing love, karma is a “batch.” Let’s keep it moving. BravoTV.com: What was it like telling Ray that you were angry and upset for not knowing? How has your marriage been affected by the news? KH: My biggest concern in all of this was for my husband’s wellbeing. I wanted him to know that while I was hurt and disappointed, I was there for him. Again, bad things happen to good people all of the time. I remain very proud of him for the man he is and the life that he has made possible for me and our children. As the saying goes, what doesn’t break you, makes you. Ray still makes me tea every night, and I make him coffee every morning. He’s still my husband. 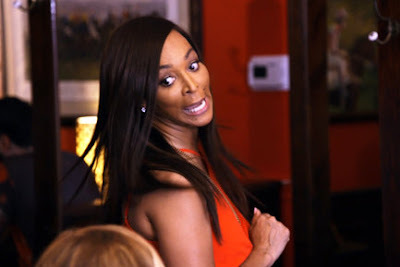 BravoTV.com: Tell us about the meet–up with Robyn – and being “stabbed in the back” as you said. What was going through your mind when she said that she and the other ladies didn’t believe you didn’t know about the situation? Can you trust Robyn now? KH: Let’s be clear, I didn’t know. Now, I considered Robyn a friend; she’s been through similar circumstances, so I asked her if I could trust her with the details of the circumstances my husband faced. Not to mention the fact that over the last two years when Ashley and the others were ripping her apart for her financial/relationship choices, I never once joined the lynch mob. In fact, I let it be known that Robyn’s life is just that, Robyn’s life, and as her friend, I would respect her wishes for privacy and not comment on how she chose to spend her money, love her man, or raise her family. I was looking forward to my lunch with Robyn. After all, she did set aside three hours out of her busy life to be there for me. I’d put my trust in her, and the lunch was supposed to be my opportunity to thank her. Not long after we began our meal, she revealed that she told the ladies the details I’d shared with her during our private phone call. In hindsight, since it was such a personal matter, I should have approached the conversation with more of a listening ear because that was why I called her in the first place — to get her insight since she had been in a similar situation. However, Robyn betrayed my trust, judged me, and ran out as quickly as she could to dish the details of our private conversation with the girls. Robyn would have you believe that I don’t know that people can read the Washington Post. That’s not the case at all. Robyn stabbed me in the back and proved herself to be a disloyal friend when she shared that I’d told her that I didn’t know about my husband’s business issues. I don’t believe that Robyn doesn’t believe that I had no knowledge of my husband’s business matter. In fact, I know that she actually did believe me because she would have said otherwise during our phone conversation. So why did she tell the other ladies anything? Why do people attempt to kick others when they think they’re down? I don't know nor do I subscribe to that way of living. We all saw Robyn’s actions, we all heard her words…well, now that’s on her. Robyn has shown herself to be a super duper backstabbing “batch”! Yes, I made up made the word “batch” for all the so-called girlfriends like her. I guess my real life’s journey (which, by the way, is MY story to tell) is one that could help anyone out there going through tough times! You can make it, raise above, haters will hate, I choose to love. It’s about the lemonade, ladies!